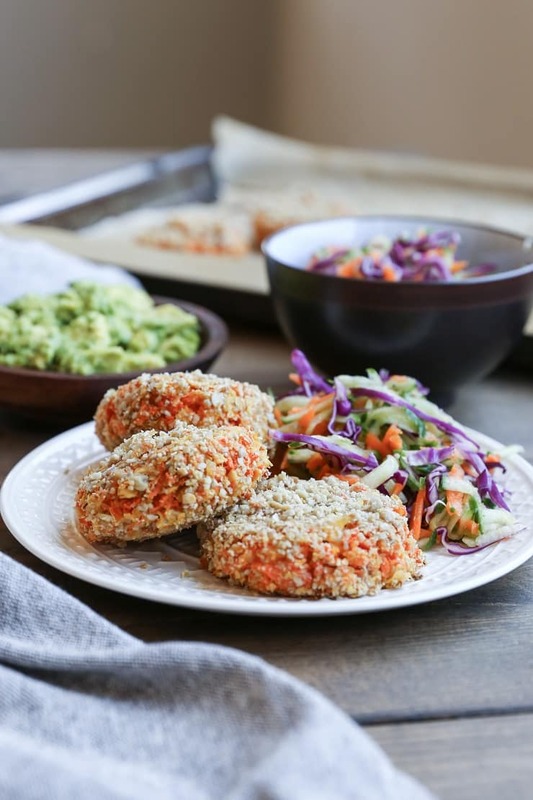 Sunflower seed-crusted sweet potato and parsnip fritters with a simple guacamole – a vegan and paleo side dish or entree, perfect for those with multiple food intolerances! Before I talk to you about these fritters, I wanted to thank everyone for their love and support on My Journey With Gut Health post! Truly, I can’t thank you enough…I wish I could bring it in for one giant group bear hug! I wasn’t sure how the post was going to go over, and you all accepted my story with open hearts, which has been such a relief, and a blessing! In my experience, anytime I open up about a personal experience (or in this case, my life’s struggle with digestive health), individuals who have similar stories or simply words of encouragement come out of the woodwork. For me, this is such a positive lesson – knowing there’s a community of folks who not only want to learn more about their own health, but also those who have been through it as well and can offer up advice. It just makes me want to talk to you about all the things. This to say, thank you, arigato, there will be more in the future! In the meantime, do feel free to let me know if there’s anything specific you have questions on, as I’m always up for a good google sesh! The recipe comes to you from an awesome cookbook I recently acquired by Debbie Adler, Sweet, Savory, and Free. 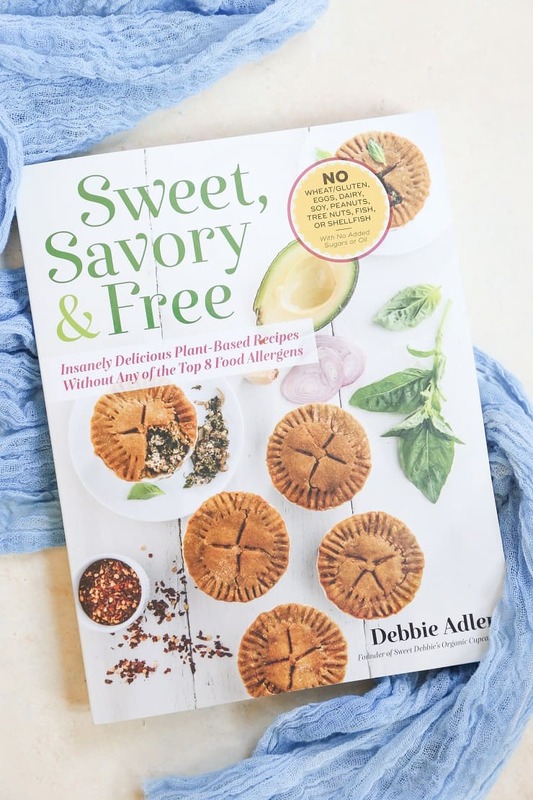 The book focuses on plant-based recipes that are free of the top 8 food allergens (wheat, eggs, dairy, shellfish, tree nuts, peanuts, fish, and soy). Debbie owns the famous bakery in L.A., Sweet Debbie’s Organic Cupcakes, and also wrote the cookbook Sweet Debbie’s Organic Treats. Her family has a history of food intolerances, so she re-vamped her bakery in 2010 to accommodate individuals with the same issues, incorporating gluten-free, refined sugar-free, and vegan options. Debbie’s new book is just as much a delight to read through as her first book! The second I saw the Sweet Potato and Parsnip Fritters, I knew I was destined to make them (helloooo, root vegetables!). Given how well-received the Zucchini Fritters with Herb Garlic Aioli and the Crispy Cauliflower Cakes were in past years, I think you all are going to love this rooty version! I adapted the recipe slightly, omitting the cilantro (yup, I’m one of thooose cilantro-averse humans), and changing the avocado mayo to more of a guac situation, but for the most part it remains the same. 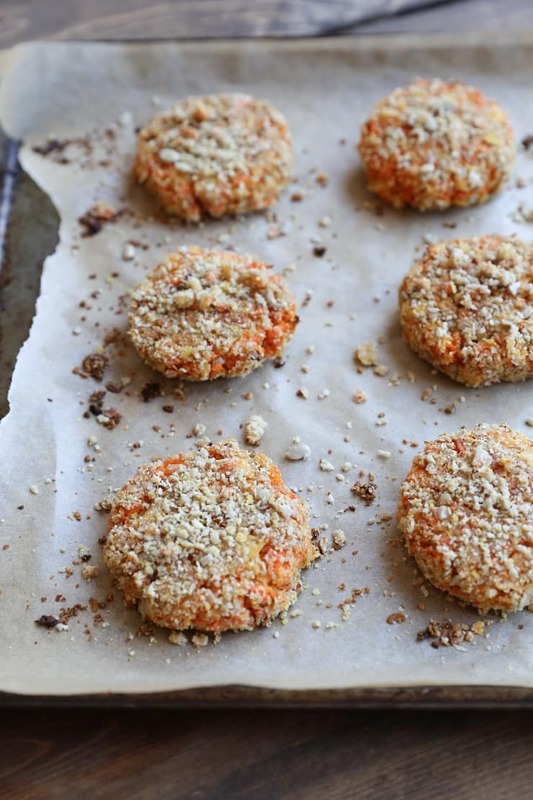 One note about these sweet potato and parsnip fritters: If you’re familiar with egg-free baking, these fritters are going to be no problem for you to prepare; however, if you’re accustomed to using eggs, just be aware they take a little extra love to assemble, as they want to crumble during the fritter formation process. The fritters still hold together without the use of eggs, but if you’re looking for a fritter that’s ironclad and you don’t have a sensitivity to eggs, you may want to consider whisking up one egg in a bowl and adding it to the sweet po’ and parsnip. I find these sweet po and parsnip fritters to be a great appetizer idea, and also an awesome breakfast option – I’m on the savory breakfast train, so whipping up a couple sunnyside up eggs (as we know, my body tolerates eggs just fine) and sticking them atop the fritters is a marvelous way to start the day. They can also be used as a nice vegetarian meal when you serve them up with a side salad or slaw. So here they be, folks! Be sure to check out Debbie’s new book, and I hope you enjoy these rooticilous fritters. Add the sweet potato and parsnip to a large pot of boiling water. Lower the heat, cover, and cook until tender when poked with a fork, 10 to 12 minutes. Drain the parsnip and sweet potato in a colander and allow them to cool. Add the fritter ingredients to a food processor and pulse until the mixture comes together, but still has texture. Stir together the crust ingredients in a small bowl. Spread this mixture on a small plate for dipping the fritters. Bake the fritters in the preheated oven for 25 minutes, carefully flipping half-way through. Add the ingredients for the guac to a small bowl and mash together until desired consistency is achieved (I like leaving mine chunky). Taste for flavor and add more sea salt if desired. 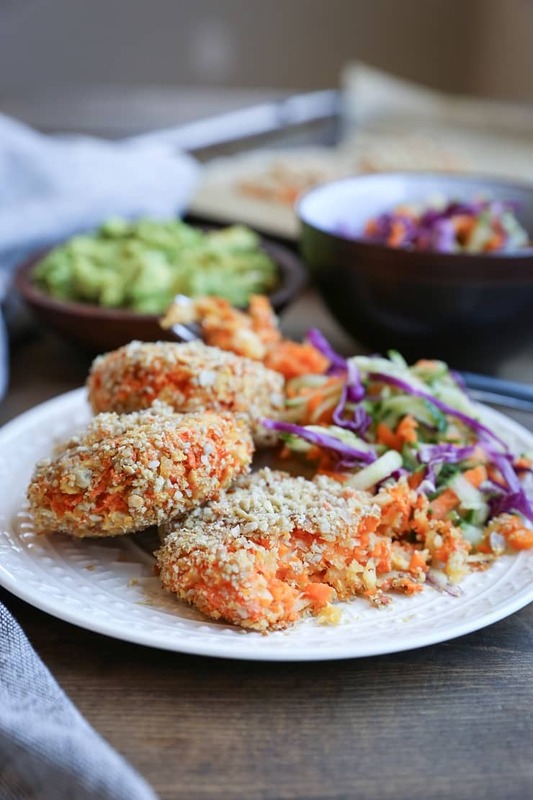 Serve sweet potato and parsnip fritters with the guacamole and a side salad or slaw. *I used my Magic Bullet to grind the sunflower seeds. **The fritters will want to crumble in your hands and during the flipping process, so handle them with care. If you are not sensitive to eggs, you can whisk up 1 egg in a bowl and add it to the sweet potato and parsnip mixture to ensure the fritters hold together better. They look and sound delicious! 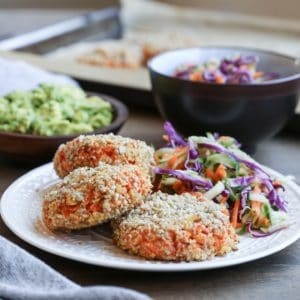 Can’t wait to make these little fritters! 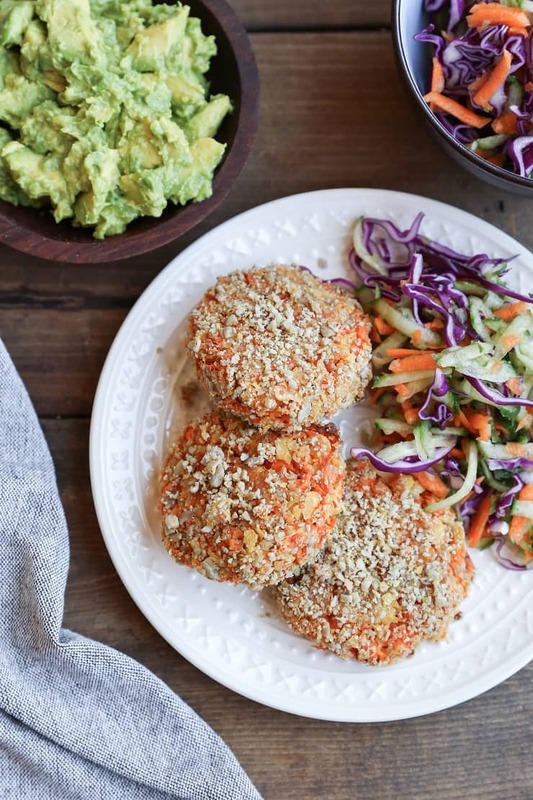 All my favorites – love fritters and the guac sounds so perfect!! Thanks so much, Kylee! Hope you enjoy! I’ve never cooked with parsnips before and I’m so excited to try! Looking forward to making this.